I have continued to run and work out over the years and I have found that my motivator has always been music to keep me moving, particularly when my body starts to tell me that I’ve run far enough especially as I have continued to advance in years. Keeping the music going while working out and as perspiration becomes a flood, especially in hot/humid climates, has been challenging at times. 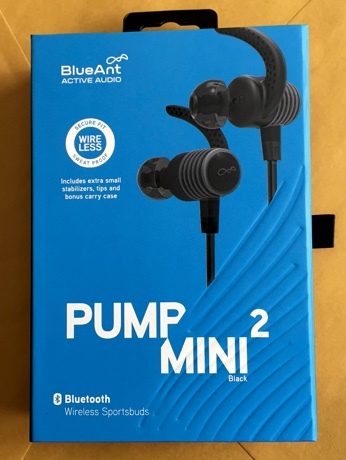 Blue Ant has continued to provide some really great headphones/earbuds that can provide the continuing motivation for someone who is into running or working out outdoors, at the gym or a health club. 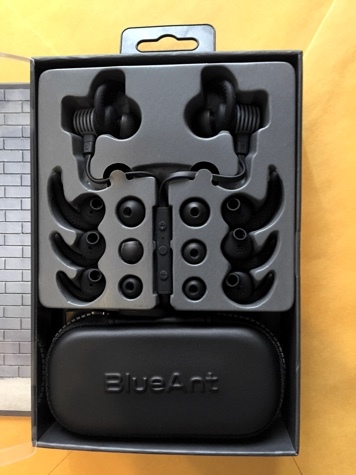 One of the first things that you will notice upon opening up the box that the earbuds come in is that Blue Ant has taken the time to even design the box that holds the earbuds in a manner that showcases the design and simplicity of their product. Included in box are the earbuds and three additional ear tips and stabilizers that are basically small, medium and large size in addition to the stabilizers and ear tips that are already on the earbuds. BlueAnt has tried to cover the bases of the different ear sizes that are out there in the world. I found that the hardest part of wearing the earbuds was just figuring out which set of stabilizers and ear tips were best suited for my ears. Yes, after three tries, I finally did get it right. 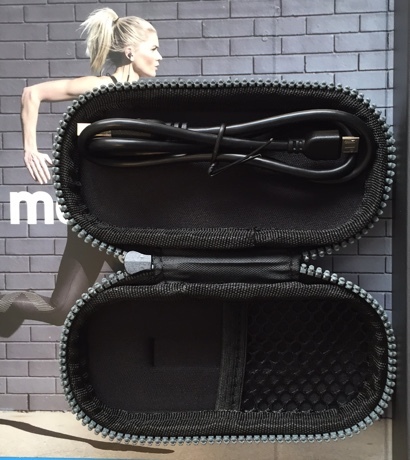 Also included in the box is a zippered carrying case and a Micro USB charging cable. Designed with an in-the-ear focus, BlueAnt has placed all of the controls (On/Off/Play, volume Up/Down, skip to next song or go back, answer your phone and Bluetooth pairing) on the small control bar (approximately 1/4” width by 1 1/2” length) that is situated on the right side below the earpiece. The charge port is located on the side of the control bar and by just ensuring that the port cover is closed and secure, guarantees that the earbuds are sweat proof (IP 54 rated). Big fingered individuals like me may find the control bar a bit too small to properly utilize until you become used to its size and location of the controls but once you do, things do work out smoothly. The size of the control bar at first kept me wary that it might break or bend if I was too rough with it but I soon realized that that was not going to happen. Thankfully Blue Ant provides you with a small printed user manual that explains the controls quite clearly. After I charged up the headphones using the supplied micro USB cable that took less than 30-minutes was to pair the headphones with my iPhone. Pairing was extremely simple; depress and hold the on/off button on the control until you see the indicator light flashing white and then checking Settings-Bluetooth on your iPhone, select BlueAnt Pump Mini2 and you are connected. Once that was done, I tried out the headphones by going for my morning 2 1/2 mile run and found that the earbuds worked great. The first set of ear tips and stabilizers that I tried lasted through three quarters of my run before the earpiece on my right ear fell out of my ear. The next morning, after changing both items, it worked well until the left ear piece fell out. The third time was the charm; once I got that right, I had no further issues at all with the earbuds, they remained in and stayed in place. Going on the run in hot/humid weather or in the gym, there was no issue at all sweating with the earpieces in. Once you get the proper ear tips and stabilizers set, my first recommendation is to set the volume control on your iPhone/phone and to verify that the volume isn’t too loud by testing before you place the earpieces in your ear. You are directing the sound directly into your ear canal and if you have the volume set too high, you can damage your hearing. So get used to checking the volume level before you start to listen to the music. I have been using the PUMP Mini 2 earbuds while I’m working out, running outside or at the gym, exercising or just sitting at home listening to some music while reading or just relaxing. The earbuds also work quite well when paired with your iPhone/phone, allowing you to answer a phone call or to make one. I had no issues at all in using the PUMP Mini 2 in conjunction with my iPhone. I did not find any issues with the earbuds becoming uncomfortable while running or working out. The nice thing is that the earbuds are Bluetooth 4.1 and I found that while I was within 50 feet of my iPhone, I had no issues at all with the signal dropping while talking on my phone or while listening to music. Sound clarity was very good for earbuds, a big plus when you want that music to work out to or to just relax and enjoy your favorites. The only time I lost signal was when I moved through rooms and the iPhone stayed stationary in one. A nice feature of the headphones being sweat proof is that once you’ve begun to use them on a regular basis, cleanup is as easy, just wipe them down and let air dry. Just make sure that you have the charging port closed and secure when you are using them to prevent any moisture from reaching the interior of the control bar. Using the earbuds with either of my Mac’s or my iPad was easy; again setup being a breeze to accomplish. The PUMP Mini 2 requires a charging time of 1/2 hour (rapid charge) and while run time is listed as 6 hours, I found mine going for 6+ hours or so. Light weight, you will not feel that the PUMP Mini 2 as a hindrance when you are working out or running. The one minor thing that I found annoying at times was the cable that connects the two earpieces with it being flat, sticking to my neck or catching on a shirt collar. When it’s time to recharge your earbuds, you will hear a beeping that lets you know “Time to charge me up again.” With the earbuds being a rapid charge system, a half hour to recharge is nothing at all in the scheme of things. *Excellent sound quality and seamless Bluetooth connectivity. *Very secure/comfortable buds – once in place, they stayed! *Sweat proof but contoured for easy adjustment even when you are sweaty. *Full charge takes 30 minutes (rapid charge) and Battery meter (on iPhone) was a very nice feature to monitor usage. *Average battery usage times was 6+ hours. *Cord became annoying as it is flat and had a tendency at times to stick to neck while working out or just catch on a shirt collar. *Charging port was very small with tiny port door (door required to keep unit sweat proof) and moderately large fingers proved more difficult to connect charging cable. The Pump Mini 2 Earbuds are available in Black, Red, Teal, Green and Purple. 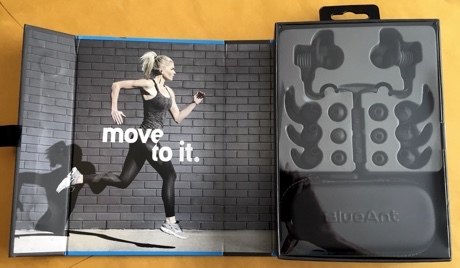 All in all, I give the BlueAnt PUMP Mini 2 Wireless Bluetooth Sweat proof Earbuds a My Mac rating of 8 out of a possible 10.